All is revealed! Everything you wanted to know about hacking into Jet Set Willy. By Andrew Pennell. Three explosive routines to make your programs go like a bomb! By Simon Lane. Upgrade you Microdrives to a professional disk system with the RENAME command. By Andrew Pennell. If you needed proof that ZIP's the best, here's a space game for you to ZIP! By Simon Goodwin. Part one of how to build your own Centronics interface - this month, hardware. By John Flenley. Meet the faces behind the QL's bundled software. By Surya. The new Ultimate game, Sabre Wulf, gets the YS treatment - with tips, hacker's tricks and a full map plan. By Ross Holman and Dave Nicholls. If you're going to get serious about program development, you'll need to study the tools of the trade. By Peter Freebrey. Frontlines 5 Facts and gossip, new products, and all the latest info. Ron Smith, YS's answer to Sherlock Holmes, digs out the latest software gossip. In his constant search for the truth (or even a ripping rumour) Ron Smith scours the software houses for news of their upcoming releases. You'll read it here first! Jet Set Willy sequels (? ), Cylon Attack (A'n'F Software), Bandersnatch (Imagine), Jolly Roger (Rabbit Software), Crusoe (Automata), A Question of Sport & Junior Kong (Interstella Software), Hyperaction (Silversoft). Psion software problems, SuperBasic errors, QL manual errors. Jet Set Willy, RAM Turbo & Sinclair joystick interfaces, QL & Epson FX-80 printer, Using the IN command. This month, the Gloucester Computing Club reviews the latest software releases. Evaluating the batch this month is the Gloucester Computing Club. Essential for software development, toolkits are often billed as the programmer's 'tools of the trade'. Peter Freebrey takes five such packages on the bench and examines whether they fulfill their promise. We've had so many pleading letters and phone calls asking for the POKEs Andrew Pennell used to 'enhance' Jet Set Willy ... that we just had to publish them. That, and the multitude of suggestions sent in by our faithful readership! Those howls aren't coming from the night - it's Ross Holman (winner of Software Projects' JSW competition) pitting his animal wits against Ultimate's mighty Sabre WuIf. Read on ... we dare you! Hacker Dave Nicholls cracks Ultimate's latest wide open - but, in the end, was it worth it? Logic and software designer John Flenley subscribes to the philosophy that if you can't afford to buy a custom-built unit, you should try and solder-it-yourself. In the first half of his two-part feature, John takes you through the hardware involved in a Centronics interface. Project 5: Machine Code Countdown. Ever wanted to rename a Microdrive file? Providing the code to create the necessary new command, Andrew Pennell brings Microdrives one step nearer the expensive disk systems they emulate. Toni Baker provides a foolproof way of redefining any graphics character. Defining graphics on paper can be an arduous task - especially when the finished item on-screen looks nothing like you imagined it. Toni Baker's got a much better idea ... and she's backed it up with machine code to boot! If you're looking for further proof that Simon Goodwin's ZIP compiler is nothing short of miraculous, type in his example program and give it the treatment. Ground Attack by Antony Crawford and Connections by D R Tose are the offerings for you to tap in and play. Two great games for your 48K Spectrum - arcade action from Antony Crawford and a popular puzzler from D R Tose. Phil Cornes goes in search of his ideal games book. In pursuit of the definitive games book, Phil Cornes and Mike Turner corner a selection of tomes, getting to grips with them all, be they good, bad or just plain ugly. Phil Manchester tracks down Nick Alexander and Steve Webb of Virgin Games to hear their latest plans. Nick Alexander and Steve Webb are no longer virgins in the software field - Phil Manchester takes a stroll up Portobello Road to check on how Virgin Games have beefed up their act. Win a year's membership to one of London's trendiest nightspots. Your Spectrum, in association with the management of the London Hippodrome, is deliriously happy to announce ... The Great Animated Logo Competition. July's favourite games, according to our readers. Your chance to air your views. Is there something you're not telling us? Make friends, publicise your club or swop your software - all for free! 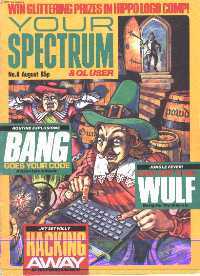 QL User appears each month within the pages of Your Spectrum. Look out for the 'Complete Dossier' edition - in the shops now! QL User: The Complete Dossier, The Sinclair QL Companion, Demise of the QL 'kludge'. If you subscribe to the motto, "It's the software that maketh the hardware", then Psion have a lot to answer for. Surya asked the authors of the QL's bundled software, Charles Davies (Archive), Martin Stamp (Quill), Martin Brown (Easel) and Colly Myers (Abacus), what they'd set out to achieve.